I got a letter in the SL mail from someone asking for skin/makeup/tat-making tips. This post is a response to them, as well as anyone else looking for a boost. There are many tutorials on the web on how to paint makeup or skin for avatars, however, most, if not all, of them seem waaaay outdated. I would like to create makeup, skin, and/or tattoos for both the default avatar and the mesh ones (like lelutka mesh head or maitreya body)…. I was wondering if you had any tips or suggested tutorials on how to go about creating such things. I don’t quite know where to start…. First of all, WELCOME to the wonderful world of skin and makeup creating. These first few creations you will do might make you feel like you can’t create anything. They may make you feel sad, let down, and you’ll get tired of trying again and again to create the right skin or makeup. Despite this, I advise you to hang in there and keep working. No matter where your work will take you, just know that you are NOT a bad artist. SL skin and makeup creation tends to make everyone feel bad because the windlights give everyone a hard time. Just to prove this to you, I’ll show you my first bout of skins. Everyone has bad ones. Take a look. For every failed skin you create, take what was best about it and try to turn it into a makeup item. Yep, that’s right. Your eye area, try to erase everything but that area, and turn it into an eyeshadow pack. Do six to eight colors and sell it. Or your lipsticks–you can get great lipsticks accidentally like that. This way, if you feel like your skin has ‘failed’, you still have that silver lining from the situation and something to sell to recoup your texture upload money. Basic tutorials on png and targa texture file isolation can be found here. I’m going to just add on with specific info and tips so this entry won’t be unbearably long. What programs/ software do you use to create skin or makeup for default avatar? I personally use Photoshop Elements. I have this entire time. I don’t have regular photoshop, Illustrator, or anything else. Remember–it’s not the program that makes your work better, it’s what you do with that program. For what it’s worth, you could honestly use GIMPshop. It’s free! BONUS – for better skin shading, get AvPainter. It’s cheap and effective for planning out where you want to shade your skin, and will take a lot of guesswork out of skinmaking. What programs/ software do you use to create skin or makeup for mesh avatars and heads? The same one. Surprise! I recommend you begin making skins with mesh heads FIRST because mesh heads are not only more forgiving, but because they can magnify certain areas of skins to show you where you need to improve. By the time you try the skin on with a system avatar, your work will look great with minimal adjustments. Can you tell me a summary of steps that you take to create skin, makeup, or tattoos for either or each? Now we’re going to start shading in our areas on the face/body sort of like what painters do here. Note how they don’t use a lot of white. Don’t. Stay away from it. Try employing red or orange for some shadows on multiply layer mode when you need to accentuate a darker part of the skin. Play with the colors a bit if that doesn’t work and see what’s best for you. If you need color swatch help, look at classical style paintings. Check out how they employ rosy reds and yellows for lighter areas of the skin. They ONLY use white when it comes to extreme highlight. Remember this. You’re going to spend a lot to get this skin right. Live with it. Live outside of it. Put on other skins for a while and then come back to your skin later to get some fresh eyes on it. Let a helpful friend beta-test it. It will not be fast work for you–but if you find something out of the skin you like, you can isolate that part and sometimes create makeup from it as I suggested earlier. When you’re ready to upload your skin to SL, don’t forget to increase the brightness and contrast on your skin to give it an extra boost. Yep, using the method I described above with Photoshop or GIMPshop. But please remember, textures from photos can be copyrighted. 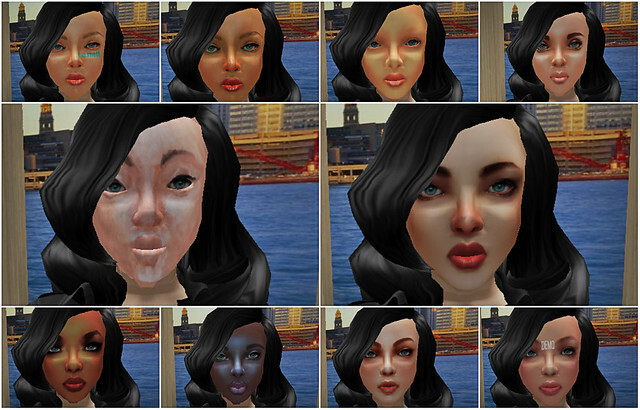 Many skin creators rip textures from celeb faces to put on skins in-world; it’s overall disrespectful to do so. Try to only use photos with the proper commercial license or places like here, to get textures you might want. I hope this will give you a big boost to your skin-making. It’s a long journey but fun and rewarding. Don’t forget to pass on the karma one day… someone helped me once, and now I’m helping others. Second Life is not so important that anyone should be stingy with their tips in order to be superior to anyone else. It’s all just art–and art without a community is useless. Hi cause iam very new to this stuff can you please explain to me how i create a painting in second life.